The List of Provinces of Japan changed over time. 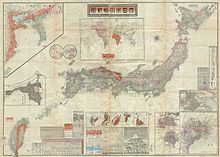 The number and borders of provinces evolved from the 7th century through the Meiji Period. In the 1870s, the provinces were replaced by prefectures. The traditional way of parsing the land of Japan was "five provinces and seven circuits" (go-shichidō). The traditional five core provinces of Japan were called goki. The traditional seven core circuits of Japan were called shichidō. The island was changed from Ezo to Hokkaidō, and 11 provinces were established in 1869-1882. ↑ 2.0 2.1 2.2 Nussbaum, "Go-shichidō" at p. 255. ↑ After the Treaty of Saint Petersburg (1875), Japan added north of Urup Island, including Urup (得撫郡), Shimushiru (新知郡), and Shumushu (占守郡) Districts.